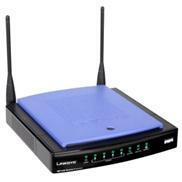 With Linksys WRT150N Wireless-N Home Router, you will be able to do more than just share the Internet. Now you can stream video, share files, listen to digital music, and make Internet phone calls from anywhere in your home, with anyone - all at the same time. The Access Point built into the Router uses the very latest wireless networking technology: Wireless-N (draft 802.11n). By overlaying the signals of multiple radios, Wireless-N's "Multiple In, Multiple Out" (MIMO) technology multiplies the effective data rate. Unlike ordinary wireless networking technologies that are confused by signal reflections, MIMO actually uses these reflections to increase the range and reduce "dead spots" in the wireless coverage area. The robust signal travels farther, maintaining wireless connections up to 3 times farther than standard Wireless-G.
With Wireless-N, the farther away you are, the more speed advantage you get. It works great with standard Wireless-G and -B equipment, but when both ends of the wireless link are Wireless-N, the router can increase the throughput even more by using twice as much radio band, yielding speeds up to 9 times as fast as standard Wireless-G. But unlike other speed-enhanced technologies, Wireless-N can dynamically enable this double-speed mode for Wireless-N devices, while still connecting to other wireless devices at their respective fastest speeds. In congested areas, the "good neighbor" mode ensures that the Router checks for other wireless devices in the area before gobbling up the radio band. To help protect your data and privacy, the Router supports WPA2, WPA and WEP security features. It can serve as your network's DHCP Server, has a powerful SPI firewall to protect your PCs against intruders and most known Internet attacks, and supports VPN pass-through. Configuration is a snap with the web browser-based configuration utility. Wanna to have this router? Check out here! This linksys N router is wonderful. It was easy to get up and running on the standard linksys firmware, which I later upgraded to DD-WRT [...]. I used the mini generic v24 beta version first, and then upgraded to the non-mini version, and now I have a FULL featured wireless N router. Other than this, the features are great, the price is right, and it's simply a solid router. Combine this with a gigabit switch and you'll have the best, most affordable home network. I bought this for $109 (not on amazon). Got it up and running in 10 minutes but Nintendo DS and PSP wouldn't recognize it. Spend 2 hours with 4 Linksys support guys (poor English and they just disconnect from you if they don't know the answer or if their algorithm fails). All 4 tech guys said it was both Nintendo and Sony's fault that the network wouldn't recognize them. Finally I gave up on Linksys tech... applied the latest firmware update to software and rebooted and it worked (NOT suggested by tech support). This is my 3rd wireless network. So if you think you'll need tech support, DO NOT buy this until Linksys gets a clue that tech support is important. Installed this router on a home network comprised of Windows XP as well as Windows Vista computers. It works great! In addition to the wireless "N" capabilities, this router also has 4 ports for wired connections. The wireless side is backwards compatible to the "g" and "b" standards as well. I've got a good mix of computers using this router, some are wired, some are wireless "n", some are wireless "g", some are XP and some are Vista -- this router just works seamlessly with all of them. My WRT54G died on me and I ran out and bought a 150N without reading the reviews. I have version 1.1 and with the latest firmware 1.0.1.9 from Linksys, this thing drops internet connection on both wired and wireless connections. I decided to investigate to see if it's a hardware or software issue. It turns out to be software as I am using DD-WRT v24 RC-6 (01/02/08) mini - build 8743 and all my connections issues are gone. My router is now stable and I can say that this is a nice device. If you are having issues, give DD-WRT a shot, you'll thank me later. I will send information on this to Linksys so hopefully they can get decent firmware out soon. It works, no problems, but for whatever reason Linksys decided not to make the antennas removeable. Previous versions (wireless g) of linksys routers had antennas you could unscrew to add better ones if you wanted to increase your range, which I do. This one does not, why? Who knows. But it is definitely a downside to the product if you have a larger home, or are a power user who wants to always have high signal strength, even out in the yard with your laptop. Return to top of "Linksys WRT150N Wireless N Home Router"! !